This is the best compound eye that I've done so far. Good enough detail to see damage. Unfortunately, one of the legs was casting a shadow on the eye and I should have taken a few more shots for the stack. This is from a compound microscope at about 40X with Sony A200, ISO 800, 2.5 seconds, Zerene stack of 35 images. I used a tissue diffuser and aluminum reflector. I also added a stack of the eyes of a very small spider. I'm not happy with them, but put them there for the curious. When I was using the microscope, I started thinking . . . What's the difference between a compound microscope and a bellows with a microscope objective? Mechanically, they seem identical except for the additional prism in the microscope. What's the difference between a compound microscope and a bellows with a microscope objective? Mechanically, they seem identical except for the additional prism in the microscope. Short answer and a question = eyepieces x objective? Deciding whether to use a microscope or a suitable microscope objective (an objective that corrects for CA independant of any additional correction performed via the eyepieces or photo-eyepiece) on a bellows, extension tubes or when used with a tube lense as is the case with infinity-corrected objectives; can in some instances depend on the type of subject, desired magnification and lighting requirements, etc. To my basic knowledge, there is no clear-cut line that says, "use a high-powered macro setup up to this point and a microscope after that"; the two approaches do overlap to some degree. Within that 'overlaping' zone either would be okay. However, there are many complex applications that require the use of a microscope and its magical capabilities. The images you've been sharing with us, would seem to me, to suit the microscope objective on bellows arrangement. 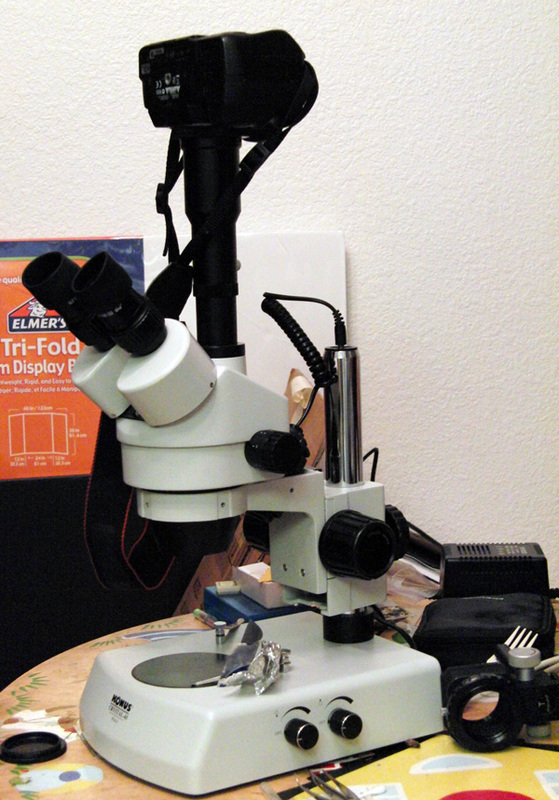 Such a setup does introduce certain requirements of its own, but also removes some of the restraints of a microscope. What are you currently using for illumination? I noticed the 2.5 second exposure and ISO 800. Compound microscope vs. objective + bellows. For reflective light and for up to 60x magn. an obj + bellows seems to me to the best setup. Will also work for transmitted brightfield with or without a substage condenser. I have seen objectives that are rated at 200x but 100x sems to be the usual maximum. So for really high magns. you need the extra 10x eyepiece and then a compound 'scope. On my 23.6 mm wide sensor, the field of view for a 60x obj is around 0.4 mm. No use for protozoa or diatoms but good enough for anything just visible with the naked eye. 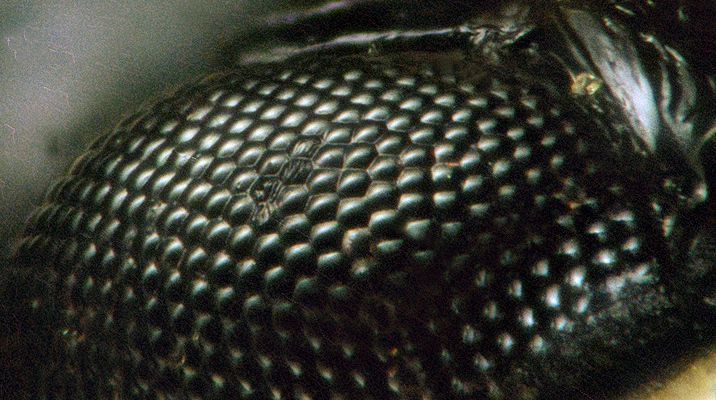 I'm attempting NOT to be rude but I can get better images of an insect eye with bellows+objective than you are showing from your microscope. Thanks Craig and NikonUser. It just seemed to me that a microscope is nothing but a tube with an objective at the end. It wasn't rude, NikonUser, but keep in mind that my results are more due to my lack of skill and my equipment than a general problem with photography through a microscope. This is about a 10-year old, $200 microscope that I'm using. I'm sure that others can get better images through a microscope than I'm getting through a microscope. So don't let my images be representative of all microscope images. Craig, as for illumination, right now, I have two microscopes. One is a trinocular illuminated from below and above by halogen lights. The other is a compound lit only from below. So, when I use the compound for macro work, I illuminate it with the halogen light from the other scope. I pass it through a tent made of tissue as Rik suggested and then use a small section of aluminum can to reflect light from the other side. The biggest problem is my low working distance objectives. Since the objective is nearly touching the subject, it's hard to get much light in there and it comes in very obliquely. I have ordered a proper stand-alone illuminator and am awaiting its arrival. Then I'll be able to use ping pong ball diffusers and such. How about telling us a little more about the microscopes and optics you are using (markings on the objectives for example) and, very important, the way the camera is attached. Reading your previous posts I can't really find any descriptions, but I see a few possible "caution flags" in some of the techniques. You can get surprisingly good pictures with surprisingly modest equipment. But you can also get garbage with the very best equipment if used improperly. OK, here is the information and some pictures of the setup. The trinoc is a Konus Crystal Pro-45. It has magnification of 7 to 45X. This is the adapter that I use to connect my Sony Alpha 200: http://www.bhphotovideo.com/c/product/332550-REG/Konus_5404_SLR_Photo_Adapter_with.html. I know nothing about the objectives as they say nothing on them. There are two of them aimed at angles toward the subject and it appears that they cannot be changed. I included a picture of the objectives with the housing removed also. And here is my compound scope. It is a Boreal Digital Skope 57900. But the built in digital camera is only about .8 Megapixels, so I don't use it, I attach the Sony using the same adapter. The strawberry pictures that I uploaded once were taken with the built-in digital camera. This scope is intended for use in schools, it's not a research scope. There are three objectives and they read: "4/0.10 160/0.17", "10/0.25 160/0.17" and "40/0.65 160/0.17". I cannot determine who made them. Just putting a piece of paper under it and focusing, the 4X has a working distance of about 1.5 cm, the 10X about 4mm, and the 40X is almost touching. I use the light from the stereo to illuminate a tissue tent and put a reflector on the opposite side. Here's a picture with the camera removed for better visibility. Feel free to ask additional questions. And assume that I know nothing about microscopes or cameras (because the assumption is 99% correct). No recommendation is too simple or question too basic. The photos above were all taken with the Casio Exilim EX-F1 which, unfortunately, has a built-in lens. But it does take video at over 1,000 frames per second! I guess I could put a reversing ring on the end of it and do some macro work. Thanks -- these are very helpful. I attach the Sony [to the Boreal] using the same adapter. Does "same adapter" mean the long black tube with a 10X eyepiece mounted in the bottom of it? I would like to know the field width seen by your Sony camera through the 4X objective on the Boreal. To determine this, just put a mm scale on the stage, take a picture of it through the microscope, and post out the picture. Try to get at least two tick marks in the field. If I understand your setup, you may not be able to see two tick marks at once. In that case, please also take a picture of the mm scale through the Konus at its lowest magnification, and show us that also. The purpose of these questions is to be more sure that we understand how the optics in your scopes are set up now. Yes, please try what Rik asked.... a photo of a mm scale with the 4X on the Boreal, and also one at lowest power setting (and if possible a middle and high setting) on the Konus. A few additional questions that will help us. What are the markings on the Konus eyepiece that came with the photo-adapter? Is it the same as the "viewing" eyepieces on the Konus? When you have your camera attached via the Konus photo-adapter, is your focus in the camera very different from the view seen through the eyepieces, or is it relatively close to the same? (Let us know how it is with both the Konus scope and the Boreal scope). Is there any other "glass" component in the photo-adapter other than the 10X eyepiece that came with it? Are there any adjustments on the photo-adapter, or does it simply "bolt on" one way? When you use the photo-adapter, does the eyepiece rest and "seat" directly into the microscopes eyepiece tube and the adapter slips over that? ....or... is the eyepiece contained and "held within" the photo-adapter? 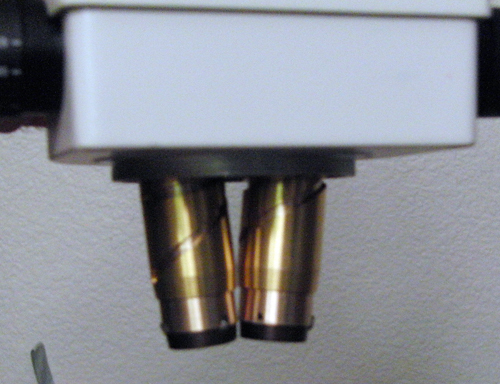 (I don't need to see the T-mount end... but if possible a couple of photos of the microscope connection end and attachment method could be helpful). If you fill in some of these "blanks" we should be able to offer better suggestions. Yes, Rik, I'll do that tonight and post the pictures, thanks. And "same adapter" does mean same black tube with the eyepiece in it. I also have a calibrated microscope slide that I can use at higher magnification on the compound scope. Charles, the eyepiece that came with the adapter says WF10X. The viewing eyepieces on the Kronus say the same thing but are different tube diameter. The eyepiece that came with the adapter happens to be exactly the same eyepiece as the compound scope except that the compound scope eyepiece has a pointer (so I don't use it for the photography). The adapter itself does not have any glass in it. The eyepiece goes in the scope and then the adapter slides over the eyepiece tube and bolts on. It has an alpha to t-mount adapter screwed in. The focus is not the same through the eyepiece and through the camera on both scopes and since the Alpha 200 does not have live preview on the LCD, that's a pain. The trinoc photo tube length is adjustable, but if it is not screwed all the way down, it rotates when I press the button on the camera (I'm getting a remote shutter release which should fix that). It is possible to only put the adapter on half way and turn the thumb screw, but it doesn't seem to make much difference because the eyepiece doesn't move, only the camera. So, on the compound, I use the eyepiece that came with the adapter and it is the same diameter as the one that came with the scope (with the pointer in it). The eyepiece that came with the adapter happens to be exactly the same eyepiece as the compound scope except that the compound scope eyepiece has a pointer (so I don't use it for the photography). 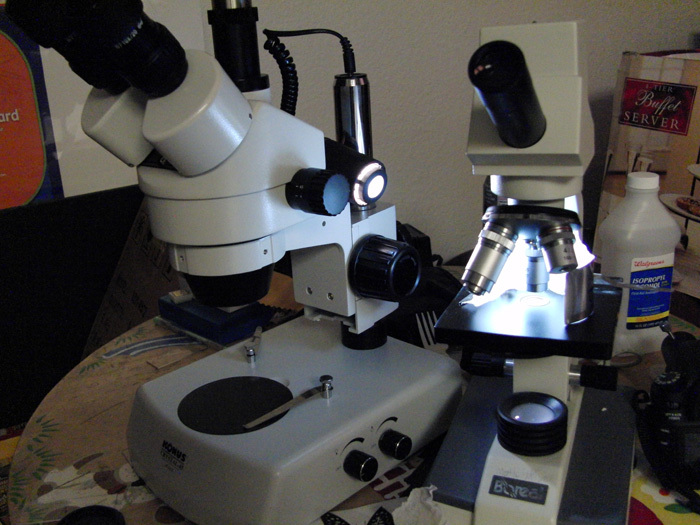 I also have a calibrated microscope slide that I can use at higher magnification on the compound scope. Pictures of that could be helpful. What we are actually trying to determine is the true magnification, on the camera sensor, that you are getting with your arrangement. If a mm ruler scale is too coarse to calculate this then the calibrated slide would be good. Is the camera now recording a view that includes most of what you see through the eyepieces, or does it seem like you are getting a strongly "cropped" picture (higher magnification) in the camera? They definitely have the same overall appearance. Definitely the same dimensions all around. I can't say if they are identical since they're not right in front of me but I'll take a look when I get home. I will definitely get the pictures that can show you the magnifications that I'm getting. Yes, I am getting a cropped image on the camera. I have to zoom out on the stereo scope to get the same field of view as what I see with my eyes. I don't recall if the same is true on the compound, but I would assume that it is. So, when I take the pictures, I'll let you know what I see with my eye as well as post the picture of what shows up on the sensor. 4.5XTrinocNO10X.JPG is the photo tube on the stereo scope without the 10X adapter eyepiece. It could see 3mm on the ruler. With my eye, I could see 4.5 mm. There was about a quarter turn on the big focus knob difference in focus here. 4.5XTrinow10X.JPG is the photo tube with the 10X adapter eyepiece. It shows just over 1 mm and everything is upside down and backwards. 0.7XTrinocw10X.JPG is with the zoom set at 0.7X and with the 10X adapter eyepiece. It shows just over 10 mm on the sensor and about 32 mm with the eye. The microscope was impossible to focus at 0.7X without the 10X adapter eyepiece. Then, 4XCompoundw10X.JPG is the compound microscope through the 4X objective with the 10X adapter eyepiece. It showed just over 2 mm on the sensor. I could see 4.5 mm with my eye. Then, 200um4Xw10X.JPG, 200um10Xw10X.JPG, and 200um40Xw10X.JPG are the pictures of the 200 micrometer calibrated slide through the 4X, 10X, and 40X objectives with the 10X eyepiece on the compound scope. The field of view of the 400X was just about exactly 200 micrometers. I was wrong about the eyepieces being the same. They are just the same tube diameter. The lens in the top of the one that came with the adapter is much larger than the one that came with the microscope. They both say on them "WF10X-18mm" and one of them has a picture of eyeglasses. With both microscopes you are recording, in the camera, a higher magnification than you should for best results. This is especially true with the stereo microscope. For example, with stereo at 4.5X (and using the eyepiece in the adapter) you are recording, in camera, at about 22X. With the adapter you are now using, the results should be significantly better if you recorded in the 7.5X to 9X range. If the stereo were set to 2X, a good range would be 3.3X to 4X. The compound microscope is not quite as "over-magnified" but still too high. With the 4X objective you are recording now at about 12X. I would recommend trying to get to the 6.7 to 8X range with the adapter you have. The way you can reduce your recorded magnification is to "elevate" the 10X eyepiece in the adapter slightly above the current "seated" position. This can be accomplished by adding something around the tube on the eyepiece (cardboard, tape, a rubber-band) so that when the eyepiece is inserted it will rest slightly higher than is occurring now. You'll have to experiment with the degree of "elevation". I would start with about 5mm, but you will likely need more than that. Ideally the eyepiece and camera should be positioned so that when these magnifications are recorded in camera, the focus in the camera and in the eyepieces would be the same (or at least very close). Since the camera height is not adjustable (or very slightly so depending on where you clamp the adapter) you may not be able to reach this "ideal" situation, but you should be able to get much closer than you are now. Once we get the recorded magnification in line there are a few other things that will need attention. You already know that you need a remote release of some type. Until you get it, if you are going to use your finger to release the shutter be sure to use the self-timer. 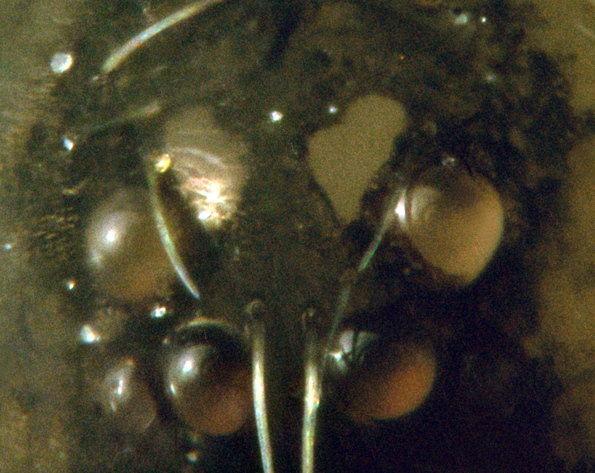 The 4X and 10X can be used for subjects like bugs without a coverglass. But the 40X should really only be used with a coverglass (0.17mm thick is the ideal). In reality the working distance on the 40X appears to be too short to light from above anyway. Try to avoid using ISO 800 if at all possible. I'm not familiar with your camera's imaging characteristics, but generally you want to stick as close to the normal "base" ISO as possible. If your camera has some type of mirror lock-up provision be sure to use it. If not you will want to go to some effort to avoid vibration problems. (Vibration is a big issue in for high magnification shooting). Generally this boils down to using electronic flash, or using shutter speeds in the 2-4 second range. This usually allows vibration to dampen out at the start of the exposure and provides a steady apparatus for the bulk of the exposure time. (Don't move around or rest on the table during exposures). So see what you can do in regard to obtaining the magnifications suggested above, and see if that does not make a significant improvement. Thanks, Charles, for the great information. I will work on the magnification issue and keep you posted. Using the time is a great idea that I hadn't thought of. My camera doesn't have the mirror-locking feature. It seems like I've been using high ISO and long exposure times because the subjects just aren't very reflective. When photographing the ruler last night, I was using 1/25 of a second compared to the 4 seconds I need when photographing insects. So, low ISO and long exposure yields better quality than high ISO and shorter exposure? I rarely use the 40X. Most of the insects I've done are with the 10X. I certainly can work on some vibration reduction too. So, the idea behind using flash to reduce vibration is that the flash doesn't go off immediately upon opening the shutter. Does the camera do that automatically or does it have to be set that way? Thanks again, this is going to be very helpful. As always, Charles' analyses and recommendations are spot on. For the compound microscope, another option I do not see mentioned is to just remove the eyepiece from the trinoc tube and let the objective form its image directly on the camera's sensor. Optically, this would be like having objective on bellows. It would be even better in this case if you could get the camera mounted closer to the end of the trinoc tube. With some awkwardness, it is probably possible to mount the camera on tripod slightly above the end of the tube, then light seal around the gap with some cardboard or dark fabric. At present, your adapter with eyepiece is giving about 2.6X magnification on top of the objective's rated magnification. For example, using your 4X objective, 1 mm on the ruler spans about 10.3 mm on your sensor. 10.3mm/1mm = 10.3X, 10.3/4 is about 2.6 . If you could mount the camera within an inch or two of the top of the trinoc tube, with no eyepiece, then you could cut the additional magnification to perhaps 1.3X. This would give you a brighter image as well as a larger field. With the 4X and 10X objectives, it may also improve your image quality (depending on what the eyepiece currently is doing). With the 40X, image quality will probably degrade because the added "tube length" from objective to image will introduce aberrations. The main advantage of using flash is that flash exposures are very short, typically 1/1000 second or less. This has the usual effect of "freezing" motion because the image cannot move very much during the brief time that the light is on. So flash does not really reduce vibration, it just reduces the bad effects of vibration. With most cameras, the flash does trigger immediately after the shutter opens. Some cameras can be set to trigger the flash just before the shutter closes. This is called "second-curtain sync". I don't know whether your camera provides that. So, low ISO and long exposure yields better quality than high ISO and shorter exposure? Yes. Each pixel is essentially a photon counter, with the maximum count determined by the ISO setting. Low ISO sets a large maximum count; high ISO sets a smaller maximum count and compensates by scaling. Noise in the image is mostly due to sampling uncertainty in the counts. Larger counts have relatively smaller uncertainty, so lower ISO gives less noise. There is also some light-mimicking thermal noise that accumulates even in the absence of real light. To minimize this noise, you want bright light so that maximum counts can be accumulated in the shortest possible exposure time. This is another advantage of using flash.